YOURS FINANCIALLY . . . Life Finance and Films! The world of finance seems so alluring and fascinating but pick up any article or any book on the same subject and all you find is jargon that you can not begin to comprehend. 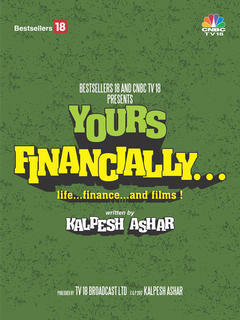 However Kalpesh Ashar’s new book YOURS FINANCIALLY . . . Life Finance and Films! which is on its way to gathering immense success and amazing reviews changes all that. Imagine learning about personal finances and all of its aspects in an engaging story that not just educates you with new subject matter but truly entertains you, after all isn’t that all that we seek in a book. YOURS FINANCIALLY . . . Life Finance and Films! has all the ingredients of a great masterpiece engaging content, incredible protagonists and a very new and innovative way of presenting information wrapped in an incredible story. Mr. Kalpesh Ashar has been in the field of Financial Services since 2005,starting as an associate of a Financial Services company based in South Mumbai. Mr. Kalpesh regularly features on Personal Finance shows across many prominent television business channels along with contributing various articles in the print media. With regards to the same subject he conducts seminars / presentations on financial literacy and awareness. In 2009, Mr. Kalpesh Ashar undertook his journey of transiting from being a Financial product distributor to becoming a Professional Certified Financial Planner. He successfully completed his CFP certification in August 2010 with Financial Planning Standards Board India (FPSB). He then actively commenced the Financial Planning Process for his clients. Since February 2014 Kalpesh is a Registered Investment Adviser with SEBI. 1. Kindly tell your fans more about your book and yourself in slight depth. Mr. Kalpesh Ashar:I have been in the field of Financial services since the past 12 years. I am a Certified Financial Planner and a SEBI Registered Investment Advisor ( RIA ) operating from Mumbai. This is my debut in the field of writing a book. 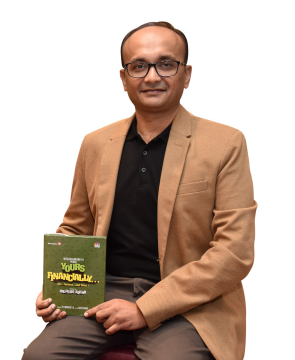 Being a first time author ' Yours Financially ' is my genuine attempt to portray the crucial aspects of personal finance and various aspects of life in an interesting and unique way.Thus far, there have been hundreds of books written efficiently in the field of Personal Finance. I have attempted to break the mould by writing this book as a fiction with a cinematic touch thus making it a compelling read. The language used is simple and without any jargons. 2. You have many accolades in the field of finance like your CFP Certification. What motivated you to pursue a career in finance? Mr. Kalpesh Ashar : As mentioned above, prior to being in the financial services field in Mumbai, I was based in Oman for 11 years and gained experience in the field of Corporate finance and Human resources. I returned to India, with the sole intention of pursuing entrepreneurship in the field of finance. I made my foray as a Mutual Fund Advisor and Distributor in 2005.Since then I have always made an endeavor to move in a space which lets me be as close to my clients and have better interaction with them on a professional basis. I discovered the fantastic CFP module as the right medium to tread this path as it would put me in the space where I would be able to advise my clients on a holistic basis. Later in 2014 I took up the fee based financial advisory model by registering with SEBI as a RIA. Today this model allows me to interact comprehensively with my clients and address their requirements effectively. 3. What was your inspiration behind the book? Mr. Kalpesh Ashar :There were basically two factors which inspired me to write this book. The first factor is FINANCIAL AWARENESS ( or rather - lack of it ) which I have noticed is a very crucial factor and is amiss in a majority of individuals. There is a huge need for creating this awareness as the financial world is getting complex by the day with new concepts and products surrounding us. This leaves the normal person clueless and baffled to make the right choice. 4. Did you face any challenges during the time you were writing? Mr. Kalpesh Ashar :To be honest, as I was clear about the broad theme and flow of the story from the very beginning, I did not have a major challenge. 5. Your book features an underlying Bollywood current in the story and even in the cover image of the book. Would you consider yourself a Bollywood aficionado? Mr. Kalpesh Ashar :Yes, I am very much an avid cinema lover since my childhood. I simply love watching movies and the medium just thrills me as it is the best form of expression of a creative mind. An amazing script and screenplay are the main criterion to keep me hooked on to a movie.Storytelling is the best way to put your point across and I have used this medium to convey my thoughts through this book. My book can be termed as 'The injection of Personal Finance given in the syringe of Bollywood'!! 6.There have been many new changes recently in the financial sector of our nation like Demonetization and GST implementation. Can you offer your views on the same? Mr. Kalpesh Ashar :I am completely in favor of these two game and nation changing moves initiated by our respectable Prime Minister in the long term interest of our nation. He is the first ever leader who has taken the mantle of fighting menace of black money and corruption head on. It is obviously the right step in the right direction. 7. Your Book explains the concepts of personal finances in a very innovative fashion involving two captivating couples. Do you have any advice for the youth of the nation with regards to managing finances or otherwise? Mr. Kalpesh Ashar:Yes, the two couples in my book are young couples who begin their life journey and encounter similar situations but it is their respective AWARENESS, ACCEPTANCE and ACTION which decides their outcomes. These are three 3 thoughts which the youth of today should imbibe in their life.